I just turned off the “I’m on sabbatical” out-of-office reply in my email, so I guess it is officially over. I want to share here how it went and what I learned. As always, I aim to share what it is like to be a professor at a small institution with a full teaching load and research expectations, since it has always seemed to me that there is little information available online for that scenario. Many people have asked me how I set up my sabbatical research term at the University of Chicago, and I will address that, and the process for applying for a sabbatical at my institution, in a separate post. I officially began sabbatical on July 1, 2017, but I started a small research project with my sabbatical lab in January 2017. So in July I worked on moving that project into manuscript form. I also started other projects, four science-based ones by my count, and one organization project for the lab. I don't want to give away too much on the nature of the projects, as I am always mindful of scoops. So I will focus on how my knowledge has expanded. In grad school, I worked primarily on projects that involved proposing if different models could explain the change in nuclear magnetic resonance properties of a material after it was irradiated. So, it was a lot of irradiating with linacs, scanning with MRI (animal and human systems), and fitting data to a curve. There was a lot of fiddling with materials production and data acquisition. Pre-tenure, I worked on using just a NMR spectrometer - no imaging - to understand how radiation damping could affect the NMR values of materials if you apply just standard models (like exponential recovery and exponential decay) to get the NMR parameters. Essentially, I wanted to know how much radiation damping can be present before you start getting significantly different results in the relaxation rates. I left imaging because of taking on the position at Wheaton, a trade off in many ways. For my sabbatical, I wanted to get back into imaging. It might be a bit easier for me to get back into imaging research as my primary research endeavor, with the great Cancer Imaging Archive now available. But I needed to retool a bit and learn things that have developed in the field. So I lucked out and got to work with the Giger lab at the University of Chicago. I didn't work with making the images; I mostly used radiomic features already extracted from images. I learned so much! I gained experience in machine and deep learning, looking at data in terms of large-number statistics (like the Kolmogorov-Smirnoff statistic, p-values, 95% confidence intervals, etc.) instead of error analysis coming from the curve fitting or instrumentation, working directly with radiologists on a project, receiver operating curve statistics, cluster computing, and image analysis. It has been quite exciting to see how much Matlab as advanced in those latter two categories since 2009, when I finished grad school. I have to emphasize that it was a huge advantage to work in a lab where there were already robust things going on. The Giger lab has been working on these research questions for a very long time, and I am hugely benefiting from the expertise and experience there. It truly is a case of standing on the shoulders of giants. It was also very significant to me to get to work with other scientists. That might sound like a strange thing to say, but in grad school I was the only student on my project (and for much of the time, there was really no one else on the project, as my advisor was closing out his R01 on the project), and during my pre-tenure time I worked primarily with students. In some ways, research has always been very lonely for me, so it was a pleasure to attend research meetings weekly and share an office with another scientist. And this might sound especially weird, but the sabbatical was particularly valuable for me because I had the opportunity to work with other women in my field. That has never happened before! I enjoyed the friendship of the excellent women in my grad school program, and I have had great female colleagues at the two institutions where I have taught, but I have never before worked with women on research projects. It was good for me to get out of my comfort zone, too. 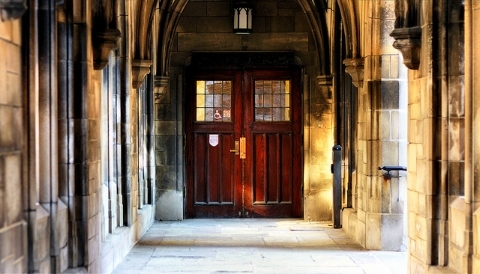 I worked at the University of Chicago two to three days a week, and at home or my Wheaton College office on the others. The (long) commutes were some good solo time to think and listen to podcasts, and it was a pleasure to walk around the University of Chicago and try out the food trucks and Divinity School coffee shop. I needed a good kick in the pants to get out of my three-mile radius Wheaton comfort zone. I was hoping that I could extend my sabbatical to a full year, but unfortunately, I have not yet landed the NIH grant that would have made it so, although I am still trying (latest submission is in advisory council in January, and I'll resubmit in February if it doesn't get funded). My institution covers full salary for one semester or half salary for a full academic year, and I couldn't swing the full academic year without outside funding. However, in the spring I will continue to make use of my Visiting Scholar status at the University of Chicago and will commute in two days a week to continue on research. The research questions are just too interesting and the people are too great to work with to let this drop just because sabbatical is over. And I hope that having hard-and-fast research days, compared to teaching days, in my schedule each week will be supportive of productivity. The best part of the sabbatical, by far, was getting the chance to unabashedly, fully be in the mindset of a learner. This is the posture I want to have in my life all the time, even when I am teaching classes, because there is always more to be learned, even when you are teaching a course for the tenth time. But pre-tenure, I had to be very careful about how much I talked to students about things I was wondering about in physics, since several of them took that to mean that I did not have any expertise in the field. This sabbatical was a wonderful time of having my expertise be meaningful AND my questions welcomed. On my last official day of sabbatical, December 31, 2017, we got a revise and resubmit on a manuscript, so that was a good thing. I have a proceedings paper due in a couple of weeks, an oral presentation to give at SPIE Medical Imaging, a conference abstract to finish up this week, and another project that is moving along, so it has been a productive time.